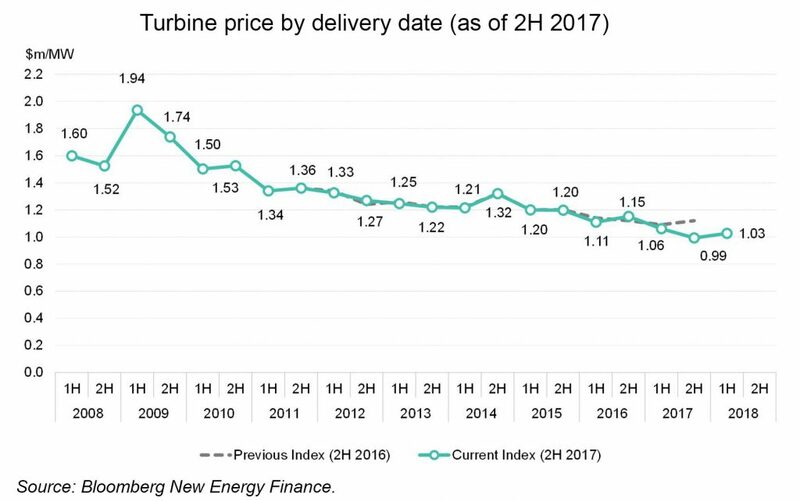 The price of wind turbines set for delivery in 2H 2017 averaged $990,000 per MW according to Bloomberg New Energy Finance’s Wind Turbine Price Index. Prices broke through the $1 million per MW barrier largely due to competitive pricing in established markets of Western Europe and North America. The Wind Turbine Price Index tracks turbine supply agreements for turbines to be delivered within the next 18 months. By aggregating and levelizing private contract data, the index serves as a benchmarking tool for buyers and sellers. If you would like to access or participate in the Bloomberg New Energy Finance Wind Turbine Price Index, please contact Keegan Kruger at kkruger3@bloomberg.net. Note: Shows global average pricing for turbines by delivery date (solid line) and the pricing reported in the previous, 2H 2016 Wind Turbine Price Index (dashed line), expressed in million dollars per megawatt. Contract prices cited here are unweighted averages. They include the cost of towers as well as transport to site (overland and marine). VAT is excluded as are the costs of site works and other construction and commissioning costs. Contracts that include transport and other costs in pricing – such as grid connection/substation, cabling, access roads and foundations – have been adjusted (i.e., these amounts are deducted) according to pricing data provided by the participants. Contracts in foreign currencies have been converted to euros at the exchange rate of the day of contract signing. All prices were converted at the day rate at contract close.